I just shot with someone this past Sunday who has a ~$55k Custom Gold San Remo (K-80). Suffice to say I was sure to stay clear of it aside from checking it out before we began. I think at $10-$10K you have something reliable, fairly decent looking. As far as six figures?..... I'd have an H&H. Remember, all things relative, this guy who has the high end K80 is big horsepower. He's not the least bit worried about dropping $55K on a gun, doesn't phase him a bit, super nice guy too. 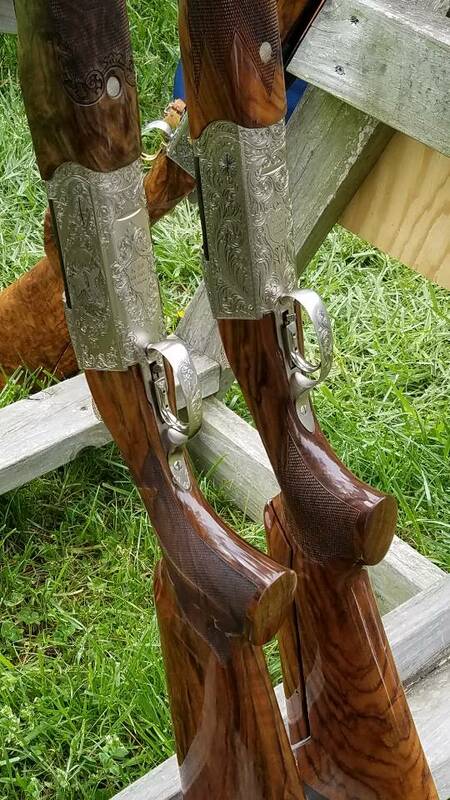 Also remember, the guys who are usually shooting the far upper end of presentation grade sporting guns aren't necessarily the "best" shooters, just the ones who have a taste for the finer things, which, I can appreciate but admittedly don't fully understand. See the gun in the background of this photo? $45k dollar Crown Grade, guy doesn't even care enough to put in ON the rack properly. There's close to $100k there in three guns, no sweat, at Hopkins Game Farm in po-dunk Kennedyville, MD. How much would I spend now? I have the three Guerinis I want. I have a friend that lent an $85,000 K-80 to a fellow shooter for a month! He’s also a super nice guy and not worried about something happening to the gun. He’s got a bunch of others. I few years ago a guy in North Carolina mailed my FFL a Kreighoff and told me to just send him a check when it arrived and I was satisfied with it. A little less than a year later he mailed me a two tone submariner with the same level of trust. Never met the man in my life, he went on my word and both transactions were super smooth. Vast majority of the people involved in clay target sports are both reliable and trustworthy,.. in my experience anyhow. Most of us are insured for full current replacement value on our main guns, kinda foolish not to be really. Not that I would be overly pleased if something happened to mine either way, but at least it's something that would be covered for theft/loss. This thread reminds me of a guy with whom I sometimes gunned at hunt tests. We volunteered at GSP, Weim, and similar events - usually saw him down at McKee-Beshers. I always have the camera gear handy, just in case. He was out this day with a simply beautiful LC Smith, knocking around in the mud and weeds, helping me kill chukar and pheasant over Master dogs. He's definitely of the "they're meant for shooting, not dust collecting" school. If money was no matter, I am sure I would spend plenty on several o/u shotguns, maybe a couple rifles too. Thing is, even when you win the lottery, money is still a matter. Plenty of lottery winners declared bankruptcy afterward. I have bought a number of target shotguns from folks on the popular shotgun website and have never had a problem. Even got one with an approval period with no money sent. Clay shooters are honorable people. Well in that case, I would spend between $5k and $12K as spending more would not get me a better performing gun. With me, it's the performance/balance/swing. K guns are too heavy and P guns seem to always have trigger issues. Artwork is on my walls at home.